Decorated with striking imagery from the beloved Harry Potter film series, this journal is an exciting addition to Insight’s best-selling line of collectible pop culture notebooks. Harry Potter is a worldwide cultural phenomenon that continues to have a devoted and growing fan base. This exciting new journal is themed to Hufflepuff House and is an eagerly awaited addition to Insight Editions’ four journals based on the spectacularly popular franchise. Fans can now choose among six Harry Potter-themed journals, each featuring gorgeous concept art of different elements from the film—Ravenclaw, Hufflepuff, Gryffindor, Slytherin, Hogwarts, and Deathly Hallows—or collect them all. With sturdy construction and sewn binding, this journal lies flat, and the 192 lined, acid-free pages of high-quality, heavy stock paper take both pen and pencil nicely to encourage inspiration. The journal also features a ribbon placeholder, elastic closure, and 7.5 x 4.5–inch back pocket, ideal for holding photographs and mementos. 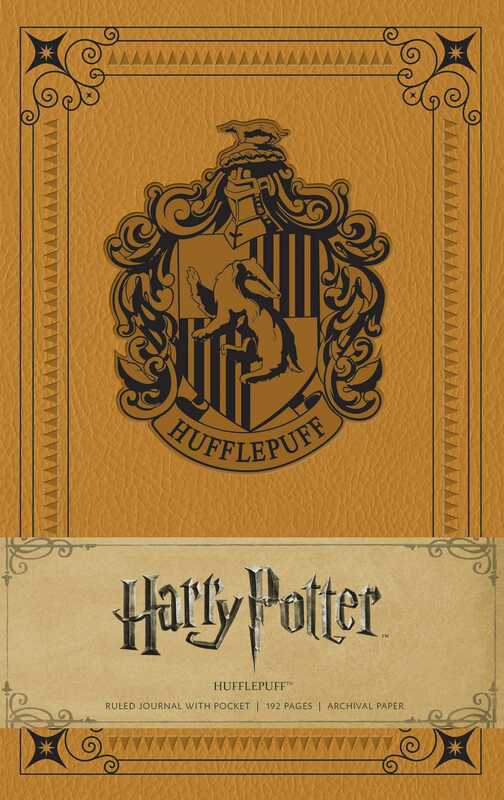 The perfect accessory to the beloved Harry Potter film series, the Harry Potter Hufflepuff Hardcover Ruled Journal invites fans to chronicle their own magical adventures.